Nicole grew up with a family that had many dogs. Her dad trained and sold duck-hunting Lab’s. As a child, she grew up at field trials, watching dogs hunt and live. Dogs come naturally to her. “I feel like I know what they think.” She currently has 4 in her home, all rescues: Jill – Jack Russell, Lily – Poodle mix, Texas – German Shepherd, Tahoe – German Shepherd. 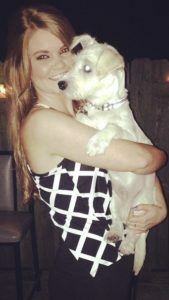 Nicole is orginally from Eastern NC, attended East Carolina University and is formally trained as a BS Registered Nurse. She worked, previously, in Trauma ICU and Dialysis. She has two sons that attend ECU. The kennel is a dream come true for her. You will find her there most days, either working in the kennel or doing office work. 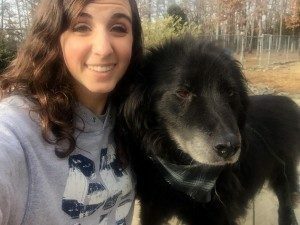 Nikki Randazzo literally has been working with dogs at Charlotte Kennels since she was 5 years old! She has been home schooled since first grade. She will graduate 2015. Audrey who works with us, is her mother. She loves spending time with her friends and family. She has four dogs, Shadow (Chow/Lab), Butch (Husky/Lab), Rosie (red nose Doberman) and Lonnie (red/nose Pitt Bull Terrier). Nikki says her favorite part of working at the kennel is caring for and playing with all the animals that come in. Her hobbies include shopping, going on retreats with her church and lots of pool time in the summer. Nikki knows Charlotte Kennels up one side and down the other, for sure. She has a deep love for animals and is very in tune to any and all issues that may arise. We feel very luck to have such an exceptionally smart, friendly and knowledgeable leader in our establishment. Welcome Reagan Walters!! Reagan currently attends Weddington High School, she plans to go to UNC Wilmington or NC State University. At this point she is unsure of her major, but she will figure it out quickly. Reagan is very organized, friendly and has a great love for animals. Her hobbies include lacrosse, dance and going to the beach. She currently has one dog at home “Herschel”, he is a Maltese mix. We are very excited to have Reagan and look forward to having her expand her wings with us over the next few years. Meet Madison Gruca. Madison graduated from Porter Ridge High School in 2017. She is currently attending UNC Charlotte and majoring in communications. Madison has lived in Union County her entire life, a rarity these days in this area. Madison has three dogs Duke, Winston and Nelly, which are all rescued mutts. Her hobbies include hanging out with friends and family, swimming and most importantly playing with dogs! 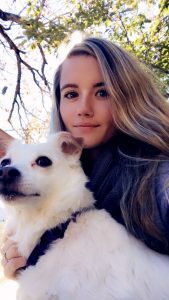 Madison enjoys working at Charlotte Kennels because she gets to do what she loves and considers to be a hobby ….which is interacting with all animals but especially dogs. Meet Kayla! She is a recent graduate from Porter Ridge High School and plans to attend the Aveda Institute of Charlotte in the near future. In her free time she enjoys shopping, listening to music, spending time with friends & family, and of course being surrounded by animals. Kayla has her own horse, Roxie, a beagle named Luna, and three cats. She is very hard working with a huge heart and we are very lucky to have her. 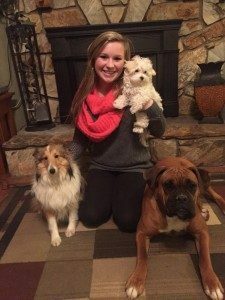 Kayla loves every pet that comes into Charlotte Kennels like they are her own! Sarah is in school at South Piedmont Community College and set to graduate at the end of the year. She is planning on transferring to UNC Charlotte to pursue a degree in communications. 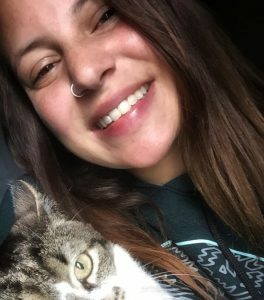 She has 2 dogs at home (Sammi and Lucy) and has loved animals her whole life! She just recently took a lead position in the kennel and will be working in out front office as well. All we can say is that Caitlynn is an animal lover!! Loves all animals. She owns 3 dogs and a hedgehog named “Stitch”. She is planning on going to college at Roanoke College Fall of 2018, she will study Psychology and Art. In her spare time she rides horses, pleasure western riding…she also works part time in a local horse barn. As far as hobbies, she loves to draw, paint, write and hang out with friends. We adore her and love that she treats all of our guests animals as her own. Meet Jacob Atkins, he has been working with us for a year now. Jacob is originally from Mecklenburg County but has lived in Union County since a very young age. He was homeschooled and graduated in 2017. Currently he is taking online courses to become a certified computer technician. In addition to working part time at Charlotte Kennels, he helps his dad with his heating and air conditioning business. 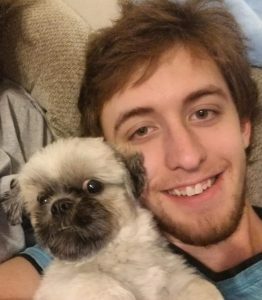 Jacob says he is absolutely an animal lover and currently owns a shih tzu named Murphy. He enjoys reading, gaming and exercising in his spare time. We are very excited to have Jacob on our team… he is a very big hearted, helpful & friendly person. Meet Mackenzie Griffin! She currently attends Porter Ridge High School. Her hobbies are fishing, shopping, and spending time with her family. She currently owns 3 dogs, a Boxer named Candy, a Sheltie named Missy, and a Maltipoo named Bella. In the future she would like to become a veterinarian assistant or a dental hygienist. Mackenzie has a natural feel for animals. She has grown up around them and appreciates the knowledge she has gained to this point, regarding ALL animals. We feel very excited to have found such an exceptional young lady to join the team!! Emily attends Piedmont High School and plays for their women’s soccer team. After high school, she plans to attend either NC State or UNCW to study veterinary medicine or marine biology. 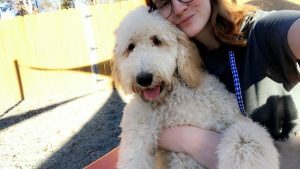 She has loved animals ever since she was a little girl, which drove her towards her study choices in college and working at the Charlotte Kennels. 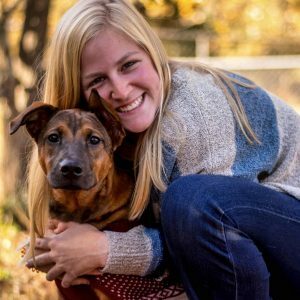 Emily comes from a family of six, they own two dogs, Baxter, a toy poodle, and Ginger, a lab mix. Hobbies include going to the beach, spending time with family, and playing soccer. Currently Emily works weekends due to her very busy school schedule. 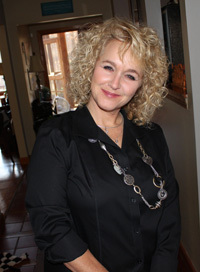 Originally from Dayton, Ohio… but has lived in Charlotte for 16 years, and loves it. She is a graduate of Butler High School, CPCC and currently deciding what to major in. 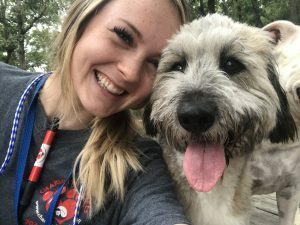 Allison has had many rewarding experiences volunteering for animal shelters over the years. Her entire life has been growing up with cats, dogs and a few reptiles, bunnies, guinea pigs, etc. Currently she has 4 dogs, 3 cats and a bunny that are all rescues. 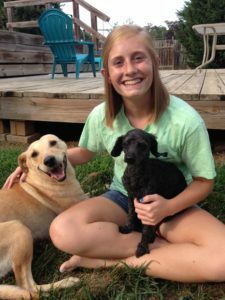 In addition to working at Charlotte Kennels, she pet-sits part time for multiple families and loves what she does. We are happy to have her as a part of Charlotte Kennels to help care for our many guests. 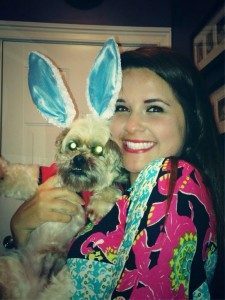 You will see and hear Allison at our front desk… she is excited to meet you and your furry best friend! Meet Tasha Rhone, she is originally from Melbourne, Florida and move to the Charlotte area when she was 4 years old. She graduated from Sun Valley High School, currently she goes to SPCC and is majoring in Criminal Justice. Tasha ….says she loves working at Charlotte Kennels, because of all of the animals and how inviting all the staff members are at the kennel. She also volunteers frequently with her criminal justice program. Tasha has 4 cats two of which she found roaming the streets, her most recent acquisition is BooBoo, which came from the Humane Society of Union County and was fostered at Charlotte Kennels. 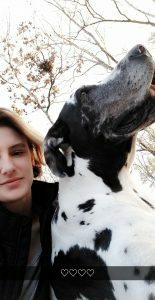 She has two dogs as well, Cupcake a Great Dane and Winston an English Bulldog. Tasha has a heart of gold, and all the animals love her. She is a very kind and gentle soul.